Summary: On a planet named Isis, Olwen and her Guardian preserve the Isis light, a satellite connection to Earth. Over the years, they’ve recorded data from the planet and sent their records to Earth, in the hopes that eventually a ship will come with settlers to inhabit Isis. Olwen is ten in Isis years, 16 in Earth years, and happy with her life with the Guardian. Perfectly adapted to Isis’ environment, she is free to roam the planet as she pleases. But when the settlers finally arrive, Olwen’s bubble of isolation is popped, and while she falls in love with a seventeen year-old named Mark, she learns suddenly and painfully that her ‘adaptations’ are not acceptable by Earth standards. Put in a position of having to grow up quickly, Olwen must decide her own standards of beauty and how far she is willing to go to fit in. 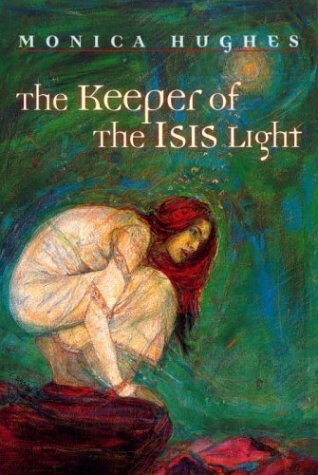 Review: For a story that’s less than 200 hundred pages long, Monica Hughes’ The Keeper of the Isis Light expertly explores themes of beauty and what it means to be an adult in a complex way. I can’t say how much I love the genre of science fiction enough because it allows writers and readers to contemplate topics that relate directly to our world today in a non-threatening manner. The story of Olwen being a remote citizen of humanity on the planet of Isis is powerful one, as she is forced to see herself in a whole new light when other humans come from Earth to her planet, Isis. Olwen’s story is a bit of heart-wrenching tale because Hughes so acutely portrays the moment of realisation that comes when you find out you’re different from the others. And finding out that the difference will cause others to treat you with fear is even worse. I love Olwen’s character because upon learning this, she still decides she is beautiful and uses the knowledge to mature quickly, taking on a more adult persona. Olwen is quite strong, facing the loss of Mark when he can’t get past her appearance, and deciding she will be better off living the life she’s always lived, with Guardian, someone she knows truly loves her as she is. But though I loved Olwen, my favourite character has to be Jody, one of the settler children who is about nine Earth years old. He seems to be the only one who is able to see Olwen as a person, and though he does think she looks strange, he is not afraid of her. Hughes shows that children are more accepting of differences, at least until they are taught not to be. The scientific aspect fascinated me, and I enjoyed reading about how Guardian tried and succeeded in adapting Olwen to her environment when her parents were killed by it. It’s another Hughes story where she explores what will happen when over-population on Earth will challenge humans to find other planets to live on, and I hope to read the rest of the Isis series in the new year. The Keeper of the Isis Light by Monica Hughes is published by Tundra Books, (1980).